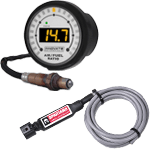 In this section you will find the range of wideband oxygen sensor products we have on offer to buy. We aim to try and stock a range of them that offer different functionality to suit different customer bases, from no bells and whistles wideband air fuel ratio gauge kits from 14point7 to units which have features such as serial out or can bus for digital connections to aftermarket ECU systems from Innovate. Our aim is to provide a good selection of 02 sensor products and of course competitively priced. Wideband gauges are an incredibly important part of any performance vehicle setup, without one you really have no idea what your air fuel ratios are doing. If you are running a stock ECU and applied many mods to your motor, you really should be keeping an eye on your AFR’s to make sure your added mods haven’t gone past the stock ECU’s ability to handle them. Or if you have replaced your stock ECU with an aftermarket ECU it’s equally as important to have a wideband gauge & controller setup. You can keep an eye on your tune to make sure your air fuel ratios aren’t heading towards too lean or too rich, and can connect them directly to your ECU via analog or serial to make use of closed loop fuel control. All of the wideband kits we have on sale use the latest Bosch 4.9 sensors, these have been shown to have longer lifespans than the older 4.2 models, they also have a much faster response rate which can come in handy for finer tuning adjustments. We have a fair bit of experience with the different brands of wideband products on the market, such as innovate, 14point7, PLX, AEM, so if you have any questions in relation to which would be best for your particular application, get in contact and we would be happy to help. Are you sick of high priced wideband products that fail to live up to the hype, with either high fai.. Here we have our dual wideband gauge kit made up of two Spartan 2 wideband controllers, 2x genuine B.. This is one of our most popular wideband gauge kits, it’s a single kit made up of one Spartan 2 wide..